Projects have a lot of pieces to manage and maintain for success, and for sanity. The more stakeholders and subject matter experts involved, the more people to sign up, sign on, and sign off. The past eight years I work with, and many times recommend HubSpot, an inbound marketing software platform that provides tools and a tremendous community to help companies attract visitors, convert leads, and close customers. HubSpot has a vast amount available for many conceptual builds across inbound. Some people may keep all the moving inbound campaign components in their head. However, the more pieces, the more others sleep better when they see a plan. At my current company, Accelare, a sales rep and I began to create a campaign, project checklist to manage the development, technical architecture, and progress. Now all project stakeholders can manage a campaign along with other leadership. At Accelare we manage and update the inbound campaign projects with Microsoft OneNote*. 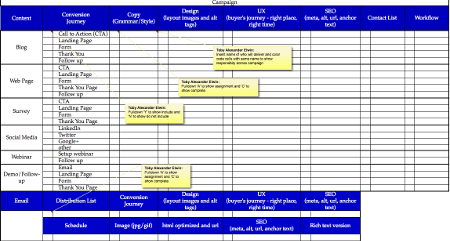 I converted our inbound, campaign, project checklist file into Excel as a resource to manage an inbound campaign project. OneNote is an outstanding collaboration, and more, tool that I will write a post on soon. OneNote now replaces many ways I used SharePoint to manage projects. In the meantime, here is a OneNote embed file that may work well for those who want to try OneNote. If you know how to save a OneNote notebook or page to share, I welcome your insight in the comments section. *Microsoft OneNote is full-feature application on desktop, cloud, smartphone, and tablet access is free on Windows and Mac, no affiliate marketing involved, just a genuinely good product.